Benefits of plantains here and here. And, after this recipe, I'm going to pick up more plantains and try these pizza ideas Healthy Nibbles and Bits. Talk about the rainbow - mamma mia!! Also pictured is a fruit salad made with pluots, nectarines, and blueberries and fruit infused water made with white peaches, lemon, and blueberries. Note: Avocado oil is the "healthiest" high heat fat / oil. Of course, there are inferior oils that may work wonders in fast food chains, but you're not eating those oils, right? Avocado oil can be heated up to 520° but it costs a little more so if budget is a concern, opt for olive oil. Coconut oil can be heated up to 350° (and grapeseed to 420°). Source. Coconut oil is a plant based saturated fat (MCTs) and should be eaten as a healthy fat. This is taught as a nutrition principle known as The Skinny on Fat in L.E.A.N. (book my service if you're interested or take my online Start Nutrition Simplified 3-week class) and more information on it from Nutiva here. 1. In a skillet, heat coconut oil on medium. Cut plantains at an angle or about 1/4" thick. 2. Place sliced plantains in the skillet in the coconut oil. The oil should not cover the bottom of the pan. The plantains will not be fully immersed as we are not 'deep' frying them. Flip plantains over after 3-5 minutes. Check to see if they're the color brown you're looking for. 3. When plantains are brown, flip and cook for another 3 or so minutes. Place them on a paper towel to soak up excess oil but not too long as the paper towel may stick. 4. 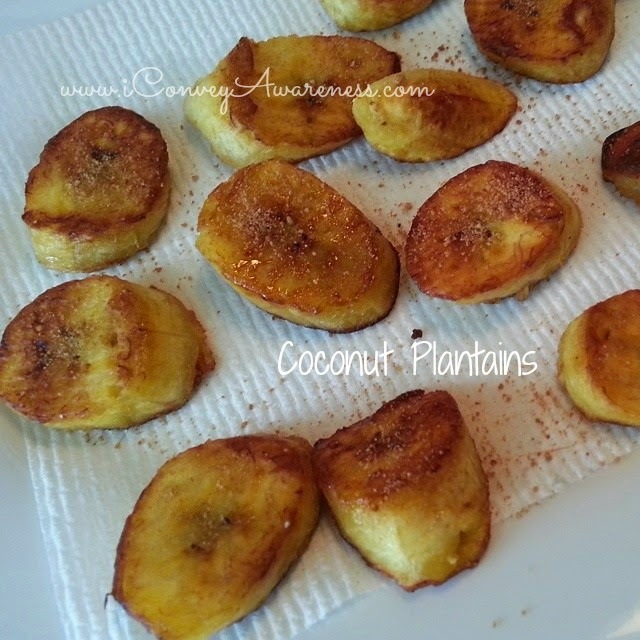 Sprinkle coconut sugar on the tops of the plantains as soon as they're taken out of the oil. 1. Take a paper towel and clean out the hot skillet (or use another pan) and heat the avocado oil on medium. 2. Place the plantains in and cook for about 3 minutes. These will cook slightly faster if using the same skillet as the pan is already hot. 3. Flip when they're a golden or light brown color. Cook for an additional 3 minutes. Like the sweet plantains, they will not be immersed in oil. Just enough oil for the bottom of the pan. 4. Remove from oil and onto paper towels. Sprinkle with a pinch of sea salt. Store any leftovers in an airtight container for up to 1 day. I don't think there will be any left though!! Other recipes you can do with plantains: Pancakes, Oven baked, Paleo Plantains with Guac, chicken stew and forum ideas from Chow. Vanessa from The Oyster Girl and I were chatting on Instagram (are you following?) about plantains and she mentioned wanting to make her own version of mofongo (a fried plantain dish) and I was thinking about Jamaican beef patties and using her idea to make the crust in lieu of grains. Does anyone want to take this on as a challenge? Great potato swap out suggestion. In the summer, especially when zucchini is plentiful, I use it in place of potatoes. I actually prefer a breakfast hash made with zucchini. We have red potatoes from the Farmers Market on Saturdays and keep them as a treat. I like the plantain idea. I have been tater free for awhile. Thanks for these alternatives! Who woulda thought? Great idea! Excellent replacement for fries and potato chips. This makes my mouth water just looking at your pictures! What a treat! 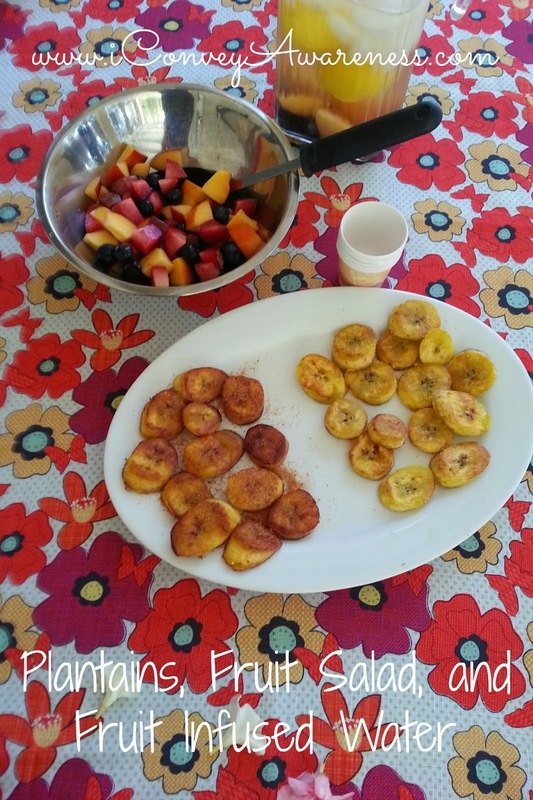 My husband loves plantains and is always happy when I serve them.Thank you so much for sharing your healthy and delicious Sweet and Savory Plantain recipe at the Plant-Based Potluck Party Blog Hop! 'm pinning and tweeting this!